The border officials were very friendly but there was not a lot of Roman script and English words so it took some time especially Customs. Everyone was checked for excessive imports. While I was buying my visa the van was checked, especially the Porta Poti. Why? Unfortunately they neglected to give Pieter the piece of paper showing the check had been done. So we had to be rechecked, a cursory affair but we had to declare that we carried our clothes, our camping equipment, our camera, our GPS and our laptops. We have not gone into such detail since some where in Africa in 2005! Georgia is poor and resale of goods without paying import duty is obviously a problem. Right after the border there was a beach - with women in bathing costumes and swimming! Turkey may be a secular state but most people are Muslim and women are not on the beaches. Women here also do not wear scarves. They wear sleeveless tops and sometimes short skirts. It is so hot some men take off their shirts exposing very white or bright red chests. The southern Black Sea Coast is almost one long continuous beach. The houses between the beach and the road are mostly derelict, though some are being actively torn down. Pre-cast sections are carried away presumably for re-use. Eventually it will become one long pleasure area, I assume. We went for a quick dip in the sea to cool off - lovely. The main road is not too bad. There are no major potholes and it is being maintained. We never stay on the main road though and beyond the main road, especially in the towns, they are either bad or absolutely terrible, even in Tbilisi. The road signs are written in Roman script and the Georgian script (not Cyrillic or Arabic, but Asomtavruli). Just a pity there are so few of them and not always at the turnoffs. Cows are everywhere - and pigs and occasionally goats. Drivers often have to swerve to the other side of the road to avoid a cow peacefully lying right in the path of the car. No one blows their horn or gets upset. Mind you this is not the only thing drivers swerve for. They also swerve for potholes and to pass other cars or trucks. It doesn't matter about oncoming traffic, other cars must move over and make room. Looking for traffic is also not required when moving off from the side of the road! There are quite a few BMWs, Mercedes and Toyota Land Cruisers, some people obviously have money. There are no large shops. There are markets for fruit, vegetables, meat and everything else. Even so we had trouble finding meat. The small supermarket type shops do have a range of goods for sale but not much variety and there are two or three close together. In one town we walked into a jewelry store to find counters on either side with each meter of counter owned by a different person. In the supermarket the same system applied except here the division was by product. The houses tend to be on reasonable size properties. They have stairs leading up to long wide verandahs on the first floor where the people live. The ground floor is also occupied sometimes. Some have gardens but most cultivate the ground. Quite a few have a small shop on the street. The people are friendly but much more reserved than in Turkey. We asked a farmer if it would be fine to stay near his house on a farm track. He said no, it was not safe, there were people shooting guns at night. We went into town and found a quiet place. The uniformed police came by and had a chat. Then the plain clothes police came by and asked us to follow them to a safer place, right outside the police car compound. Seems Georgia is not very safe! The building we parked beside was derelict. Even when new it could not have been very good. It was made of concrete prefab units for walls and floors. They just didn't line up very well. The wall sections could jut out at either the top, bottom or sides and in on another side. The concrete was also poor quality. Presumably a quick build during communist times. If all buildings were constructed this way it is no surprise they are falling down. We were up and off to an early start this morning because the sun is hot early. We headed north to the Caucasus expecting to drive along them and then south to Tbilisi. Just outside Zugdidi we were stopped at a barrier and asked where we were headed. It was made clear that we could go north if we had written permission from the police but it was unsafe because of separatist activity. We decided to head to Tbilisi instead. We certainly do not want to go into a troubled area. Generally the road went across a river plain, through some hills and then into a wide valley. Not as scenic as I had expected from the map but pretty. It also went through a rather dark tunnel that felt like driving through a mine. The driving was atrocious. Tbilisi is a reasonable size with a lot of traffic. People live in apartment blocks, real communist style, mostly drab although a few have been painted. There are no major hotels and no 'old town'. We were hoping for a tourist office but didn't find one. I must admit we didn't try too hard though. We did find a McDonalds and one of the 2 western style supermarkets. We asked the police about a safe place to park for the night and were told everywhere is safe. One good thing at least. For the rest we can see no reason to stay. We found an English language newspaper. The reporting was terrible. Exactly the same phrase would be repeated several times - not even with a slight variation! The major news was about the G8 summit and Bush's plans to deploy a missile defense system in Poland and Russia's objections. Other news included Georgia moving towards joining the EU by aligning it's foreign policy; Election troubles in Armenia; Armenian claims to Georgian National songs; Erisoni, the Georgian song and dance ensemble, cannot perform in Georgia due to the lack of local technical equipment. Petrol pumps are interesting. Yesterday we tanked at a station where the pumps had been manufactured in Germany for Holland. There was no Georgian on them at all. Today we tanked again before changing excess Lari back into dollars. This time the pump could not dispense more than 100 GEL worth. We have a large tank and spent more than this. We were woken by the gentle rocking of the van. A herd of cows was passing through and some decided to scratch themselves on the bumper. The road continued as before. We were headed to the nearest border post at Karcahi. It meant an extra 40k of bad road, but Turkey would surely have good roads. We asked several times if it was the road to Turkey and always told yes. The road was as bad as expected. We kept on thinking that surely this was not the road to a border post, but the assurances came next time we asked. It was not until we were very close to the actual border that we were told it was closed. One man in the group we asked made the international sign for money to which we did not respond. Then he wanted to know if we had proper ID. Once assured we had he was very definite that the border was closed! Mmmm! We turned around and headed back to the main road. And had a puncture. While Pieter was fixing it, the border police drove up. They checked our passport and told us this was not the border with Armenia. We agreed and explained we wanted to go to Turkey. It was only later that the reference to Armenia made sense. They were very impressed that Pieter, at his age, was as strong and fit as he is. The area is relatively flat with lots of pasture and very few trees. The trees left were obviously planted 20 or more years ago and have gradually been chopped down. They have not been replaced. The houses have lines of dried dung in their front gardens. They sometimes have dung drying areas where wet dung is spread to dry on layers of dried dung. This is eventually cut into square packs. No wood - use dung for the fire. The fields are tended manually. If there were tractors the whole area could become highly productive it looks so fertile. It is moist as well so water would not be a problem. As it is most of the ground lies fallow. We spent the night beside a bridge over a stream. Pieter impressed passing young men with his accuracy with the rifle. We were up early to get to the border post at Vale in good time. The main road was good, then we headed south again. The road was as bad as expected. We were encouraged to see 2 Armenian trucks coming through. There must be a border post at the end of the road. And there was. Turkey and good roads, we hope, just over the fence which we drove along for a few kilometers. Unfortunately when we entered Georgia we had said we were going to Armenia. This was true at the time but the poor infrastructure in Georgia changed our minds for us. This meant we are NOT allowed to go through any other border crossing. 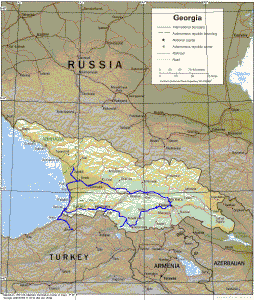 We could go to Armenia or return to the border post where we crossed over. Ye Gods, are they really that dogmatic! The comment of the border police yesterday suddenly made terrible sense. There was nothing for it but to head further west back to the Black Sea. It is a drive of 170 kilometers over a main road according to our map. The road is even on the GPS. Our short drive on this road was good so how long could it take? 2 hours? 3 at the most? Yeah-well-no-fine. It took 7 hours driving excluding lunch breaks, tea breaks and an overnight stop! Today 90 kilometers in 5 hours. The photos look scenic but the road is not quite so good when besides taking a photo I also had to check there was sufficient solid road for the Landy to drive over. We commented on the state of the road at the border. The official agreed and added it was a very dangerous road!! With the rain we do not know if the road will actually remain open for much longer. Surely it will be washed away very, very soon. This distance of 170 kilometers does include a deviation northwards. At one point there was a turnoff to some village a few kilometers along a bad road. We chose to continue on the good road. Wrong choice. Batumi, the next border post, was actually along the bad road. Why should we expect a sign to the major town at the end of the road? The road rose to over 2000 meters where there is still snow lying around. The villagers came out to watch with blank stares. Up in the higher areas houses are made from wood and dung is not used for fuel. They probably could not get it dry any way. We lost out marvelous South African braai, the special glass, normal glasses and cups to the road. Bugger! It rained all night and we were in dread of the condition of the road. But is was blessed undamaged tar all the way to Batumi and the border. With a few bad patches of course. Still it took 2 hours to drive 80 kilometers because of the twists and turns. The Georgian customs had a problem because we did not go to Armenia but at least they could solve the problem and we could go on to Turkey. We did not drive very far before stopping for an afternoon and night of rest. 4 days of bad, difficult (to very dangerous) roads plus another 2 competing with bad drivers had taken its toll.